A drafty poem that was inspired in part by Rommy’s childhood bogeyman prompt on Real Toads, though I’m not sure it really fits the prompt, as it is not really limited to childhood, but it came up thinking of the type of bargaining one does as a child (and an adult) to keep something difficult from happening. 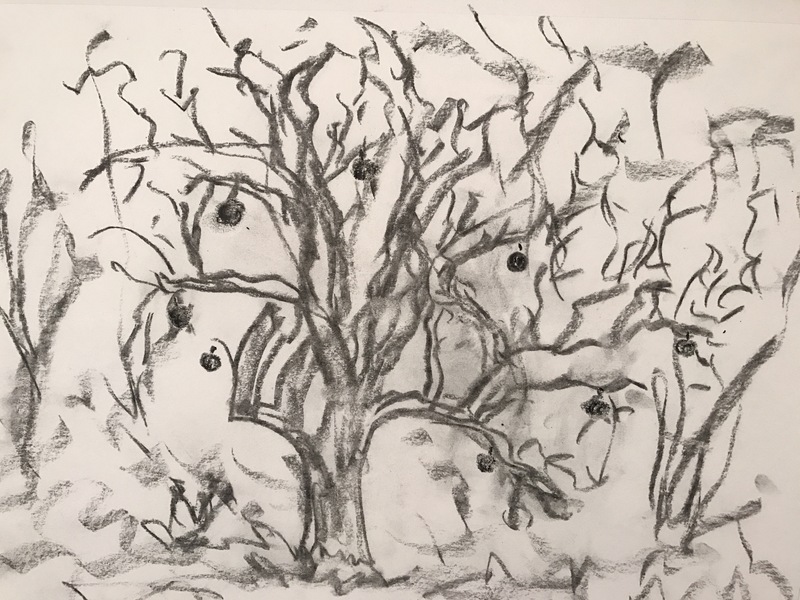 Drawing is mine–all rights reserved. This entry was posted on April 28, 2017 at 3:58 pm and is filed under poetry, Uncategorized. You can subscribe via RSS 2.0 feed to this post's comments. Bargaining indeed. In the end we can’t make some deals no matter how much we want to. I think you nailed the hopeless state of the child cornered by the bogeyman. What a bewailing helplessness; and to become the parent of that child — the adult, anyway — is to carry that anguish forward into everything we can’t prevent. That tree is laden with dark knowledge. YES. I understand this, deeply. I still have that childlike bargaining in me, so often. Wonderful work. Wonderful poem anyway – which I’m glad I didn’t live without seeing. I like that you did your own drawing. I also liked the idea of bargaining. Some things you can’t bargain. Or sell either. That’s what makes poems like yours and stories like the play of Christopher Marlow, we get into the make-believe area with out minds. The bargaining of a child…. We as adults have enough of a struggle trying to deal with what we can’t control. It is doubly painful for a child. It is always worse to endure another’s suffering than one’s own. I hear bargain and think of Faust, and wonder if that’s where we’ve been led. This is such an incredibly poignant write! That bargaining is so very real… even if it never works we try.. It is so that our bargaining continues into adulthood. To see others suffering is difficult, often painful to bear, and we make promises to ourselves, our God, in an effort to change that that is often unchangeable. It is our humanity coming to the fore. We are always making bargains, but you have the talent to draw them!